Special Collections is happy to announce the launch of our weblog. Contributions will be primarily from Special Collections librarians and staff, but all are welcome to comment. Our goal is to share news from our department as well as resources that may be of interest to our researchers and colleagues. The new exhibit Penguins, Pulps, and Pretty Ladies: A History of Paperbacks will open on May 1, 2006 and run through the end of the fall semester on the 1st floor of the M.D. Anderson Library. Texas Reference Center includes more than 80 full text journals and books about Texas history, ethnic & cultural diversity, gender studies, literature, public health, business as well as home & garden and sports & leisure. The database contains biographies portraying famous historical and contemporary Texans such as George Herbert Walker Bush, Lady Bird Johnson, Dan Moody, Susanna Dickinson and Sam Houston. Also available in the Texas Reference Center is the Spanish-language newspaper El Sol de Texas with Texas and national news coverage. This EBSCOhost database is updated weekly. To access this database, select Academic Search Premier from the library Database menu, then select Texas Reference Center from the drop-down menu below the search fields. This resource is an excellent supplement to the Handbook of Texas Online and Gale’s online Texas Almanac. The Daily Cougar (along with a smattering of college and university newspapers) is available full text in Lexis Nexis from 1998 on. To access, search "Daily Cougar" in the library catalog, and click on the record for the electronic resource. While we welcome you to visit us for Theses and Dissertations, most of the submitted theses from UH (from around 1995 on) are available for free full-text PDF download. Simply select "Dissertation Abstracts" from the library database menu. 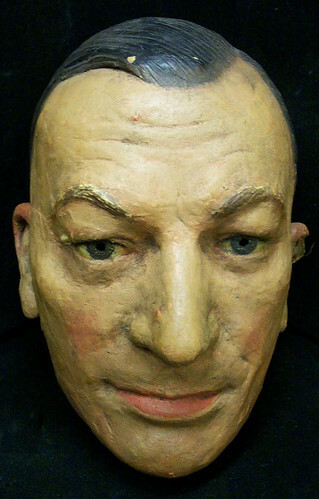 Princeton University Library’s Department of Rare Books and Special Collections has a very cool pictorial guide up for the Lawrence Hutton Collection of Life and Death Masks. In 1894 Hutton authored a print guide to the collection, Portraits in Plaster, from the Collection of Laurence Hutton (New York, Harper & Brothers), but I’ll dare to say this is livelier and easier to access. What do all of the above have in common? They’re all represented in Special Collections holdings, and each have new finding aids up on TARO.